Coconuts are packed with essential fatty acids, high-quality fiber, and totally tropical flavor. But have you ever tried to crack one yourself? No worries, we've done it for you. And obviously we've only chosen the absolute best coconuts. 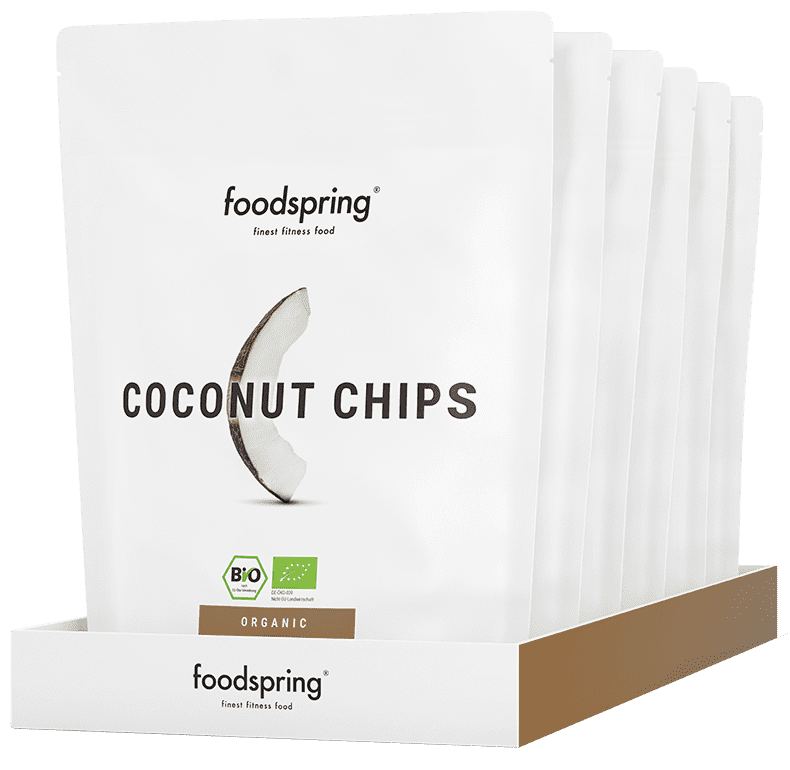 Our Coconut Chips are made from fresh coconut cut into thin strips and packed fresh. No added sugar. Pure coconut indulgence. Try them in the morning in your porridge, or snack straight outta the bag post-workout. CocO 2 Go. Throw some in your purse or your gym bag. Keep some in your pocket, or your gym bag: coco 2 go. 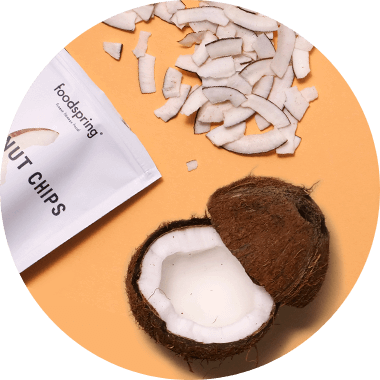 Our Coconut Chips will zap you full of all-natural energy. Perfect between meals, right before a hard run, or on your way home fromt he gym. Just tear open the bag, pop a few in your mouth, and savor the sweetness, no added sugar necessary. Goodbye guilty conscience, hello pure pleasure. Sweet or savory? You can have it both ways. Snack on our Coconut Chips straight out of the bag, sprinkle them on your porridge or muesli, or try out some new recipes. Get inspired! 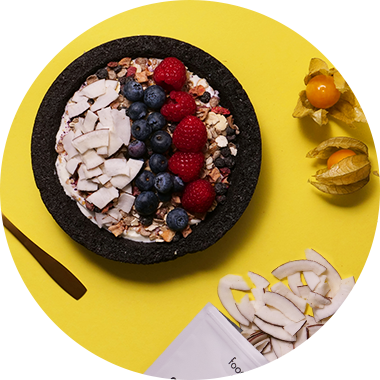 Snack on our Coconut Chips any way you like: straight outta the bag whenever you want, as a post-workout energy boost, in your morning muesli, or as an ingredient in any number of sweet and savory dishes. Anytime you need a burst of tropical flavor, our Coconut Chips have you covered. Check out our recipes and get inspired. Put the coconut oil in a heat-resistant mug and melt for a few seconds in the microwave. Let cool slightly. Add honey and egg and mix well. Add flour, cocoa, and baking powder and mix until batter is smooth. Fold in half the Coconut Chips. 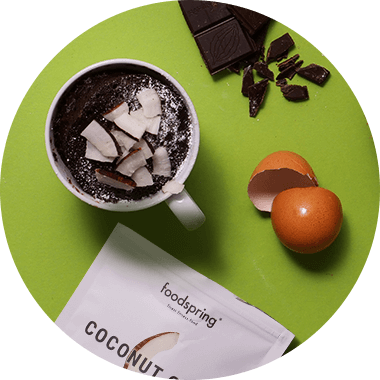 Cook the mug cake in a 900 watt microwave for 1–1½ minutes. No microwave? You can also make this mug cake in the oven. Bake for 20–25 minutes at 180°C. Just make sure that you use a heat-resistant ceramic mug. Put milk in a pan and mix in some cinnamon. Bring to a gentle boil. Add the pudding rice and let simmer gently over low heat. Stir occasionally to keep from burning. After 25–30 minutes the rice will be cooked. Add Whey Protein and Coconut Chips after 20 minutes. Add a little more milk if necessary. 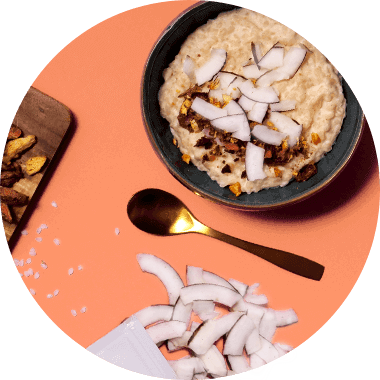 Serve the rice pudding with the remaining Coconut Chips, your choice of fruit, and a pinch of cinnamon. Preheat oven to 180°C top/bottom heat. Spread chickpeas on a baking tray and sprinkle with salt, curry powder, and paprika. Roast for around 15 minutes. Cut carrots into pieces. Mince garlic and ginger. Melt coconut oil in a pan and then add garlic and ginger and brown slightly. Add carrots. Cover with vegetable stock and cook over medium heat for 10–15 minutes, until carrots are cooked. Season with salt, pepper, curry powder, and paprika to taste. Mix in coconut milk. 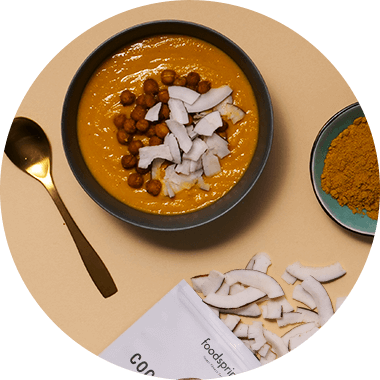 Blend soup and garnish with roasted chickpeas and Coconut Chips. Is the high fat content really good for me? Not all fats are the same. 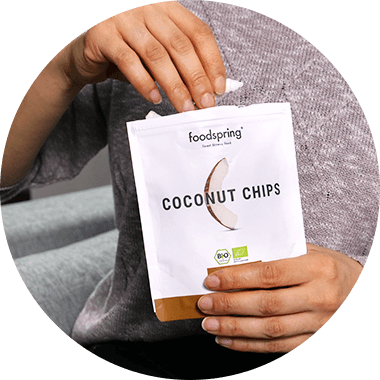 Our Coconut Chips are naturally high in MCT fatty acids. These are an outstanding source of energy that your body converts straight into pure power. What makes your Coconut Chips better than supermarket brands? We only choose the best coconuts to slice and package for you. With 100% organic ingredients, of course. What about synthetic chemical fertilizers or pesticides? No way. * We don't even add any sugar. Pure and simple, so your body can concentrate solely on using the nutrients in the coconut. Farm fresh and packed with care. So crunchy and so tasty. Nothing else compares. Do your Coconut Chips come from fair-trade, organic farms? Of course! Our coconuts are from Sri Lanka. The tropical climate there is perfect for coconuts. 100% organic, carefully harvested, and just as carefully packed. Tasty. Crunchy. Guilt-free snacking. What should I do with the rind on the Coconut Chips? Can I eat it? It’s the rind that makes the coconuts so interesting. It’s what gives our Coconut Chips their awesome crunch, and it's also packed with essential fiber. And you’ll forget all about hunger when you bite into one and the pure flavor evokes images of a perfect coconut lying on an untouched South Sea beach. Coconut Chips 6-Pack will be back in stock shortly.